The Kicking Coach kicking camps for high school and middle school athletes take place all year around in Illinois, Michigan, Ohio, Iowa, and Indiana. Kicker and punter individual training for athletes of all ages is available in Chicago and Akron, Ohio. Teach high school and middle school kickers and punters how to develop professional-level skills, and how to train effectively by themselves. Evaluate their current skill level for potential and college scholarship referrals (high school sophomores, junior and seniors). Kai Kroeger, Class of 2020 Punter, who has been working with us since 7th grade, was the top punter in his class at the National Underclassmen Challenge in December 2018. We expect Kai to be committed on a full scholarship by mid summer. Evan Morris, powerful kicker from Michigan and one of our Top Prospects, commits to Michigan State University. Kaleb Kindsvatter, TKC Alum since middle school – class of 2020 Top Prospect Kicker, went 3-3 on PATs, 3-3 on FGs, and had 6 touchbacks on kickoffs. Newspaper Link Here. 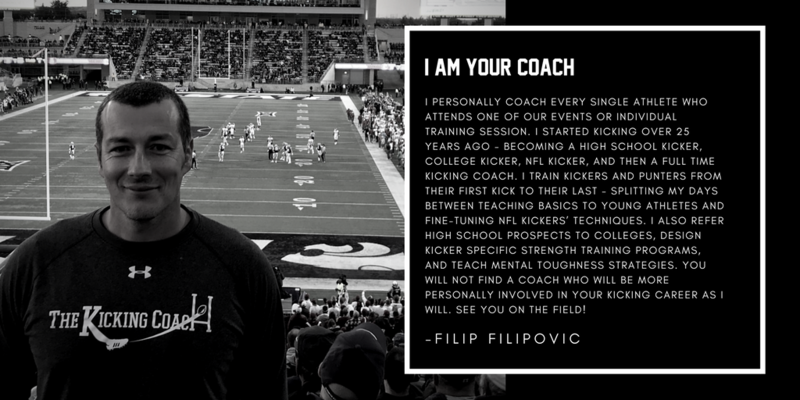 Coach Filipovic is an NFL Veteran with over 25 years of kicking experience. Assistant coaches have NFL or successful college experience.